"Truck" redirects here. For information about other types of trucks, see Dash panel ramp truck and Surfboard vehicle. A cargo truck from Mario Kart: Double Dash!! A cargo truck is a frequently occurring obstacle appearing in the Mario Kart series. Cargo trucks mainly appear in stages set on roads, such as Shroom Ridge, and will drive along the main roads with all of the other traffic. If the player gets hit by a cargo truck, it will have the same effect as driving over a Banana, causing the player to spin out. There is no way to destroy a cargo truck, but they can be launched into the air by driving into it with a Super Star, Bullet Bill, Chain Chomp or Mega Mushroom, or by throwing a Bowser Shell at them. If the cargo truck is hit by anything, it will honk its horn at the player. In Mario Kart: Double Dash! !, if the truck is lifted into the air, it stops moving, whereas in future games, it continues to move even while in the air. Cargo trucks in Toad's Turnpike from Mario Kart 64. Cargo trucks first appeared in Mario Kart 64, where they only appeared in the course Toad's Turnpike. The game features a plain grey cargo truck, a flatbed truck carrying white boxes, another flatbed truck carrying planks of wood and a pale turquoise oil tanker. The flatbeds and cargo trucks share the engine sound of Donkey Kong's Kart, and the oil tankers share their engine sound with Wario and Bowser's Karts. Cargo trucks reappeared in Mario Kart: Double Dash! !, where they appear in both Mushroom Bridge and Mushroom City. There are three different cargo trucks in this game. 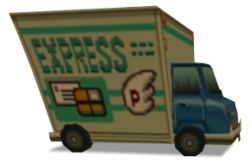 One of the trucks is an Express truck, which has a letter and a parcel on the side alongside a P-Wing, and SMB3 on the number plate, referencing the game in which the P-Wing first appeared. There is also an orange Super Chocolate truck, which has the name styled similarly to the logo of the first Super Mario Bros. game, two 8-bit jumping Mario sprites on the back doors, an 8-bit Koopa Troopa and two 8-bit Goombas on the side and W1-1 on the number plate. There is also a light-green Moo Moo Farm truck, with a Moo Moo depicted on the side, and "1-UP" on the number plate. Cargo trucks appeared again in Mario Kart DS, where they appeared in Shroom Ridge and the retro course GCN Mushroom Bridge. Two types of trucks appear in this game, one which is blue and apparently transports Berries, and one for the company Fresh. These new cargo trucks replace the old ones from the original Mushroom Bridge. A cargo truck in Moonview Highway from Mario Kart Wii. Cargo trucks also appeared in Mario Kart Wii, where they only appear in the course Moonview Highway. As well as causing the player to spin out if hit, if the player hits the truck head on they will be flattened and will travel at a lower speed for a short while. There are three different trucks that appear in this course, a blue cow print truck for Moo Moo Dairy, a green building block patterned one for Factory and an orange pineapple patterned one for Coconut Fruit. Their number plates are SMB3, 1UP and W1-1 respectively. These trucks have the same front body and license plates as the trucks from Mario Kart: Double Dash!!. Cargo trucks appear in the course Wuhu Loop in Mario Kart 7, however they have a significantly different appearance in this game. The trucks that appear in Mario Kart 7 are three wheeled yellow pick up trucks, and are about the same size as the Cars, much smaller than its appearances in previous games. The unlockable cargo truck stamp from Mario Kart 8. Cargo trucks also appear in Mario Kart 8 and Mario Kart 8 Deluxe, where they appear in the redesigned retro course N64 Toad's Turnpike, alongside two new types of truck, the surfboard vehicle and dash panel ramp truck. The cargo trucks in this game are each for a different sponsor, Burning DK, Iggy's Glass, Moo Moo Meadows Milk, Propeller Toad Transport, Shell Cup and Mario Kart 8. Some trucks also include ramps on the roof which can be accessed after using a dash panel Ramp Truck. The unlockable Stamp for N64 Toad's Turnpike is a cargo truck. A cargo truck in Toad's Turnpike from Mario Kart 64. A cargo truck in Mushroom City in Mario Kart: Double Dash!! A cargo truck in GCN Mushroom Bridge from Mario Kart DS. Cargo trucks in Moonview Highway from Mario Kart Wii. A cargo truck in Wuhu Loop from Mario Kart 7. A cargo truck in N64 Toad's Turnpike from Mario Kart 8 and Mario Kart 8 Deluxe. Cargo trucks in N64 Toad's Turnpike from Mario Kart 8 and Mario Kart 8 Deluxe. ↑ Alex Musa (May 30, 2014). It’s possible to land on top of some cargo trucks and Jump Boost off the ramps at the front of the cargo container.. Mario Kart 8 Official Game Guide, page 164. PRIMA Games. Retrieved December 6, 2017. This page was last edited on February 28, 2019, at 18:56.